This publication is a basic explanation of the impacts of temperature inversion on pesticide drift. It is intended to be a shorter, more concise version of AE1705-Air Temperature Inversions Causes, Characteristics and Potential Effects on Pesticide Spray Drift. Why are Temperature Inversions Important for Pesticide Application? An air temperature inversion is a condition in which air closer to the Earth’s surface is cooler, denser and heavier than the air higher up. During temperature inversions, air moves horizontally close to the Earth’s surface. If pesticides are applied during an inversion, small droplets readily can move thousands of feet before falling to the ground. In addition, some pesticides volatize, or change from liquid to vapor. Vaporized pesticides can move miles from the application site during a temperature inversion. During an inversion, air temperature near the surface is colder than air above the surface. At each greater height, air temperature increases (Figure 1) up to the top of the inversion. Toward the end of the day, the soil surface temperature begins to decrease and the air near the surface is cooled through conduction. Soon the air close to surface will be colder and denser than the air above it. This is the beginning of an air temperature inversion. This increase in air temperature with increasing height above the surface is called an air temperature inversion because it is the opposite of the usual daytime air temperature proﬁle. Air density decreases with increasing height during an inversion. This causes a density stratiﬁcation of the air, with the coolest, densest or heaviest air near the surface, and the density decreasing with increasing height. As a result, air can move only horizontally within the inversion. Also, within the inversion, wind directions can vary, sometimes 180 degrees in an opposite direction. The graph in Figure 2 represents the frequency and intensities of temperature inversions measured at North Dakota Agricultural Weather Network (NDAWN) sites during the summer of 2017. The colors represent the number of inversions at a given strength in degrees F. Most of the strongest inversions (3 degrees or higher) occurred in the evening to around midnight. Inversions generally are stable enough to resist mixing action when wind speeds are less than 5 mph. As wind speed increases, inversions steadily are weakened and only weak ones will form. In general, greater cloud cover causes slower surface cooling and slower inversion formation in late afternoon or evening. When skies are completely overcast, inversion formation tends to be weaker than on clear nights. Partly cloudy conditions can bring widely varying inversion conditions in the length of time the inversion lasts and in the area included in the inversion. Dew or frost formation often occurs when inversions are forming and, thus, should serve as a warning that an inversion may exist. Condensation results when the soil surface and air close to the surface cool. Fog appears when the air temperature cools to the dew point temperature. Because relative humidity is 100 percent in the fog and is very high in areas close to the foggy areas, little or no evaporation can occur. Pesticide droplets or volatized particles will not evaporate and will move downwind. More porous mulched surfaces will be hotter throughout the day because only a shallow surface layer of the mulch is heated. As a result, the overlying air also will be hotter. Because little energy is stored under the mulched surface, its surface will be much colder than the denser soil surface. As a result, inversions form more rapidly over mulched or porous surfaces and also will be more intense. Cultivation can cause dry soil to act like mulch because it increases the soil’s pore space, which decreases its thermal conductivity. Cultivation also causes moist soil to dry more quickly. The surface temperature of recently cultivated soil will be greater during the day and lower during the night, compared with an uncultivated soil. As a result, inversions will form more quickly and be more intense over the cultivated soil. Plant leaves cool very rapidly because of their low heat capacity. The lower leaves and the soil surface remain warmer because they are protected from the clear sky by the upper leaves. Because the upper canopy leaves now are colder than the adjacent air, heat energy will be conducted from the warmer air to the cooler leaves, where it will be lost as terrestrial radiation. Because upper leaves have low heat capacity and their only heat source is the shaded leaves, they will cool to signiﬁcantly lower temperatures than a bare-soil surface. Therefore, inversions over closed-crop canopies will form sooner in the evening and likely be more intense than those over a bare-soil surface. For dense shelter belts with little through-ﬂow, winds are reduced greatly near the windbreak, but wind speed fully recovers at about 15 times the height of the trees downwind. More open shelter belts allow more through-ﬂow, so wind speed is reduced less near the trees, but the downwind effect persists for about 30 times the shelterbelt height. Wind speed in both cases also is reduced upwind for a distance equal to three to four times the tree height. The reduced wind speed near shelter belts causes reduced air turbulence. As a result, daytime surface and air temperatures in sheltered areas are greater than those in open areas. However, when the surface is cooling at night, reduced mixing causes lower minimum temperatures, compared with open areas. The result is often earlier inversion formation near shelter belts in the evening and later dissipation in the morning. 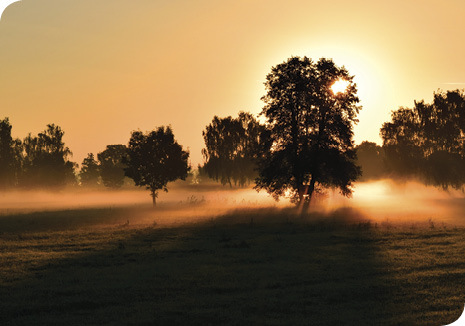 When ground fog is visible only in lower-lying areas, it could be caused by standing water, which results in higher dew point temperatures and fog. But when standing water is not present, fog in these areas is proof that cold-air drainage has occurred. Fog usually forms ﬁrst in low-lying areas, and for the same reasons, inversions often form ﬁrst and will be more intense in low-lying areas. Measure the air temperature 1 foot above the soil surface or a closed crop canopy, and at 10 feet above. If the temperature is coolest at the surface, a temperature inversion exists. The greater the temperature difference, the more intense the inversion. Avoid spraying during an inversion because smaller droplets (200 microns in diameter and smaller) fall as little as a few inches per second and could ﬂoat for long distances. Volatized chemical particles can float until they evaporate. Some pesticides are more volatile than others. Check labels for information on volatility.